"We are excited to get this party started and continue our position as San Diego’s entertainment leader and as a proud member of the community, we will be donating $1 for every ticket sold to the Susan G. Komen Breast Cancer Foundation." SAN DIEGO--(BUSINESS WIRE)--Viejas Casino & Resort in partnership with Goldenvoice today unveiled its 2018 summer concert lineup to be held at Viejas Concerts in the Park at Viejas Casino & Resort. 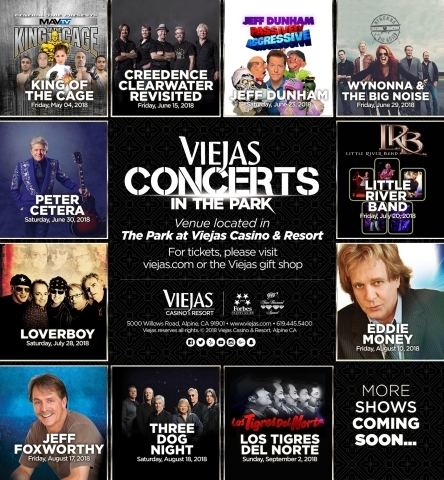 A decades-long tradition, the Concerts in the Park series at Viejas presents the highest quality entertainment in the most beautiful and intimate setting, noted for its breathtaking views and well-appointed accommodations. Tickets will go on sale Friday, March 23rd at 10AM and will be available online at axs.com or at the Viejas Gift Shop. 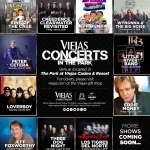 For more information visit viejas.com/concertsinthepark. Located at I-8 and Willows Road east of San Diego, the Forbes Travel Guide 4 Star and AAA Four Diamond Viejas Casino & Resort features world-class gaming with thousands of slot machines, exciting table games that include Blackjack, Baccarat, and Pai Gow, a modern and elegant bingo room, and an off-track betting facility. Viejas Casino & Resort also features a variety of restaurants including the AAA Four Diamond Grove Steakhouse, The Buffet, and The Café. The beautiful Viejas Outlets, located across the street from the casino, offers visitors a unique shopping experience with highly acclaimed stores, numerous eateries, Viejas Bowl, and during winter Southern California’s largest outdoor ice rink. Viejas Hotel features 203 luxury rooms and 34 VIP suites, including a lush, spacious pool and lounge area. The highly anticipated new tower, Willows Hotel & Spa is now open and offers an additional 159 VIP suites, luxury spa facilities, signature restaurants including Locale Kitchen & Lounge, Ginger Noodle Bar and Daily Roast plus an expanded gaming space.